Potassium is an essential nutrient you don't think about until you feel the effects of not having enough. That can be through diet or in my case, because of medication. For me, it shows in an awful pins and needles feeling in my feet, hands and face. 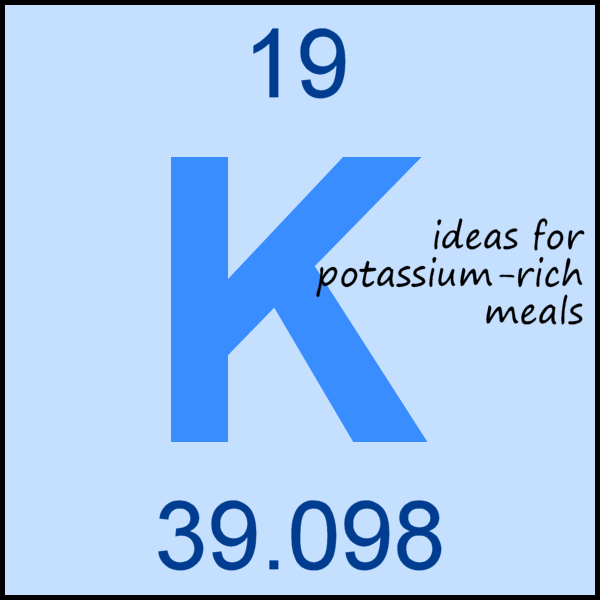 Supplements aren't the best choice in my case so in the last few months, my family has been planning meals around my need for extra potassium. When we eat out, I make choices that will have more potassium. Fortunately, that doesn't mean that I have to eat a ton of bananas. It does mean that I had to do a bit of research. These are the go-to, quick snack with potassium. One banana has nearly 25% of the US recommended daily allowance. But if you're like me, bananas are good but not all the time. One of my family's favorite meals is lentils*. That one is just perfect. It can be made in large quantity, freezes and reheats well, and everyone likes how it tastes. 1 cup of cooked (boiled) lentils has as almost as much potassium as a banana. They can also be used in a lot of chilis and soups easily just to up the potassium a bit. Tomatoes vary by how they are served of course, but a cup of tomato sauce has as much potassium as a banana as well. Knowing that about tomatoes is handy when we are going out to dinner. Spaghetti is a great choice! Yay for spinach on the list of high potassium foods. I actually strongly dislike most cooked spinach just as a side dish, but love spinach salads and like spinach as an ingredient. It can also be chopped fine and mixed into things like meatloaf easily. Popeye had the right of it. I love yogurt, and I like yogurt with bananas sliced into it, or bananas dipped in low-fat yogurt. Only just under half as much potassium as tomatoes, lentils or bananas, but also very widely available and easy to incorporate into meals. They are high carb and a starchy food but they are also a good source of Vitamin C. Potato chips, high fat and high carb are better for you than corn chips. I mentioned how much potassium they had to my optometry specialist, and he told me about a friend of his that went on a month long trek using chips as his primary source of energy and nutrition! Cantaloupe has more potassium than potatoes, but less than bananas. It's a nice, sweet treat and a favorite in my family. Almost all fish is a good choice, but some specific types come in a bit higher, including salmon, halibut and cod which are 3 of my favorite locally sourced fish. Yum. It's easy to remember those foods because they are some of my favorites. Bring back to a boil, turn down heat, cover and simmer for 20 minutes. Take off heat and fluff with a fork. Serve with hot sauce, salt and pepper to taste. She does occasionally add in other things because she likes lots of color. Peppers and other high acid foods should be added in halfway through the rice part after the lentils are cooked through. You may well prefer less cumin and spices, if you prefer things not as strongly spiced, start with half of the amounts. I too, am potassium deficient & eat those foods plus broccoli! I can eat cherry tomatoes by the handsful & bananas are the ONLY fruit I like so - whew! But (tho' I regularly eat lentils) I had no idea they are also a great source of potassium! THANKS! And thanks for the recipe! Have I mentioned lately that I REALLY appreciate all the good info and wonderful designs on your blog? No? WELL, I DOOOOOO! In this world, it isn't hard to take in a lot of potassium. In most cases, people have too much potassium. You can take a look at http://healthiack.com/foods/foods-high-in-potassium to find more foods high in potassium.